Monsieur Ducasse is known for trend-setting and innovation, and with 27 restaurants in 8 countries under his belt, he knows a thing or two about food. His specialty is contemporary French haute cuisine (the haute part refers not only to the quality of his craftsmanship but also the expensive prices of his masterpieces). “Back to basics” is built on four core concepts: taste, rare table settings, meticulous service, and haute couture décor. Each season the “Back to Basics” team will present three dishes to the à la cart menu. Examples include langoustine tartare (prepared with only lime juice, salt and pepper) and fillet of beef (which is tied, inserted with slivers of bacon and truffle, seared to seal in its juices, and roasted to perfection). 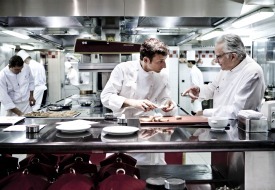 Ducasse’s plan to bring simplicity to French cuisine does not mean he is going rustic. The restaurant displays rare table settings, such as original creations by designer Pierre Tachon and artisanal Japanese pieces by Shinichiro Ogata. The staff provides meticulous service while dressed in designer threads, and the Executive Head Sommelier Gérard Margeon chooses wines with care, highlighting a growing coterie of female vineyard owners. The restaurant itself showcases a few new artistic pieces by Patrick Jouin. While this dining experience is not for the budget conscious, those with the means can indulge in Ducasse’s splurge-worthy, well-curated culinary extravaganza. A girl can dream, can’t she? Alain Ducasse au Plaza Athénée is open for lunch Thursdays and Fridays (12:45 pm to 2:15 pm) and for dinner Monday to Friday (7:45 pm to 10:15 pm). Average price à la carte is 260€—not including beverages. Rates at Hôtel Plaza Athénée start from 650€/night; 866-732-1106; www.plaza-athenee-paris.com. For more trip-planning info, check out our Paris Travel Guide, then use our Travel Search price comparison tool to find the lowest rates and travel deals on hotels, flights, and vacation packages in Paris.